Why would this creature of the sea spend time at the surface? It’s easy to look at their fish-like body and forget that killer whales need to breathe air. “That’s a sighting for the history books!” Excitement crackled through Captain Mike’s voice as it boomed over the tour boat’s sound system. Eager passengers on the Kenai Fjord Tour clung to the deck railing and stared into the waves, hoping to catch another glimpse. The gracefully arched dorsal fin of a female killer whale cut through the ocean’s surface one last time before vanishing. A few minutes earlier that killer whale had been playing almost directly below our admiring eyes. She started with a wave of her flipper, turned a few somersaults to show off the smooth white shapes on her belly, and then swam at the surface to give us an extra-good look. Such fluid grace in such a large package is a recipe for awe. We saw several more pods throughout the day, plus humpback whales, sea lions, puffins, and more, but none came as close as this. Why would this creature of the sea spend time at the surface? It’s easy to look at their fish-like body and forget that killer whales need to breathe air. Of course, seeing the misty spray of their spout should jog your memory. Killer whales are toothed whales, and are the largest members of the dolphin family, which are mammals. It’s a fact I’ve been hearing since grade school, but it’s a fact that refuses to stick. These are smooth-skinned, fin-flipping, deep-diving, cold-water mammals. Ice floes are important resting areas for harbor seals. Getting up out of the water, even if it means laying on ice, can help reduce the loss of body heat. Photo by Emily Stone. It’s no secret that I’m a mammal and I love jumping into cold water (Lake Superior and Boundary Waters lakes especially), but I generally spend just a few seconds scrubbing off layers of camping grime and then pop back out with a gasp. I watch warm-blooded loons diving all summer, but their well-oiled, heat-trapping feathers look dry even as they emerge from a dive. The body of this killer whale was smooth and dripping wet. Near Seaward, Alaska, water temperatures go from a low of 39 degrees in March all the way up to 58 degrees in August. But even an 80 degree swimming pool feels cold to us when we first jump in. Water conducts heat about 25 times faster than air of the same temperature, and washes the warmth away from a body. According to Captain Mike, the water is so chilling that harbor seals pull out onto ice floes in order to warm up in the sunshine! 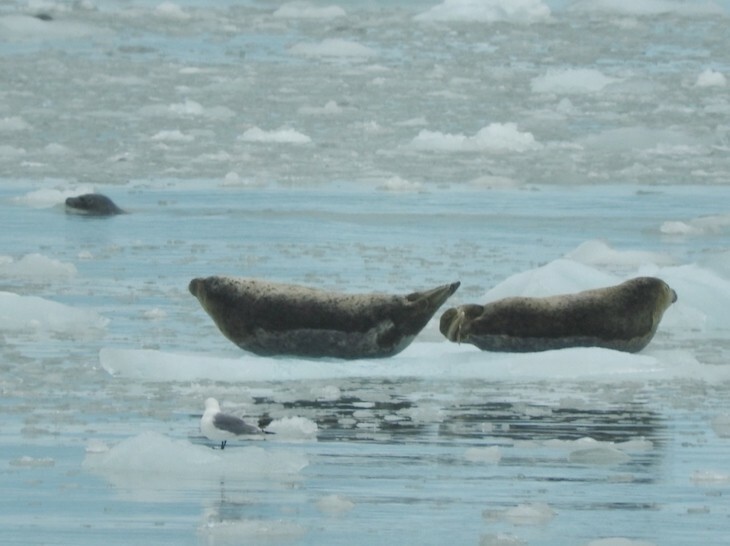 Indeed, the floating ice of one glacial bay we explored was dotted with groups of seals. Many of them looked a little bit like bananas—their heads and flippers held up off the cold surface. Hauling out on ice floes also leaves seals inaccessible to land predators and less visible to their most common predator: the killer whale. Killer whales are all fierce predators, but not all killer whales eat seals. 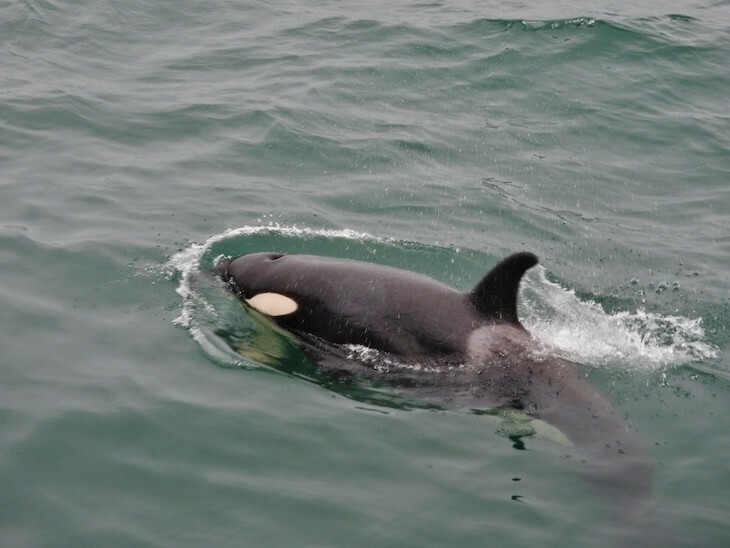 The gregarious, easily-seen “resident” populations of killer whales (like the one who I saw surface) focus on catching fish like chum and chinook salmon in a nearshore environment. This makes them a favorite of tour companies. 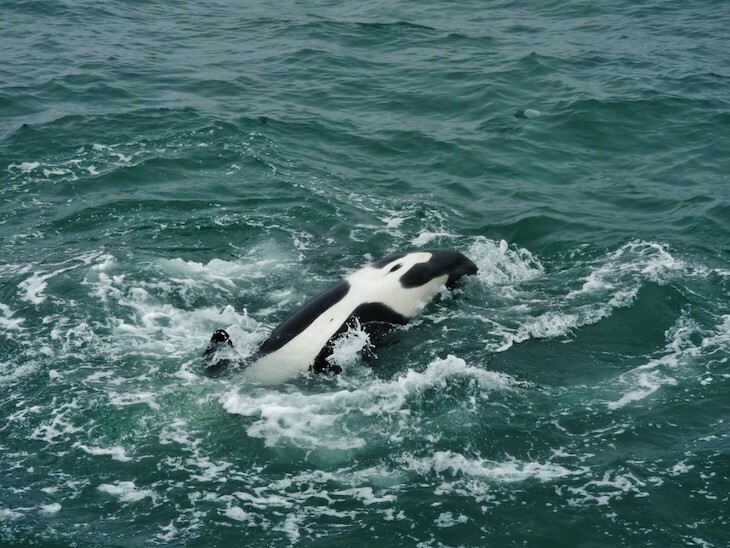 Killer whales make a variety of sounds for both navigation and communication. These include whistles, echolocation clicks, pulsed calls, low-frequency pops, and jaw claps. They also are thought to be playful and curious creatures. Photo by Emily Stone. 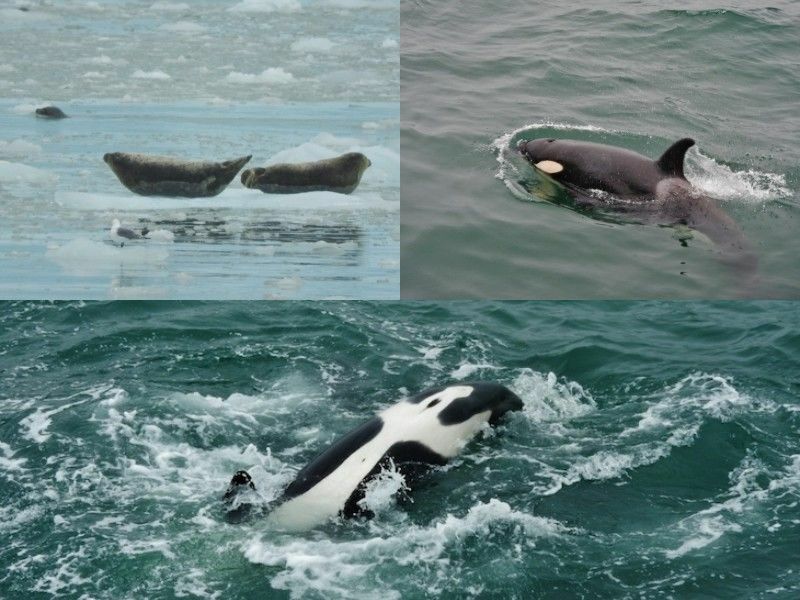 In contrast, transient populations of killer whales feed on seals, sea lions and porpoises. They may live in the same neighborhood, but they have to be stealthy and secretive in order to sneak up on their intelligent prey. While offshore populations of killer whales are the least-studied, it’s their diet of sharks and large pelagic fish that may have earned their species its name. One theory is that Basque whalers named them “killer of whales” after observed pods of orcas hunting baleen whales. Some people prefer to leave out the “killer” in their title and call them orcas, in reference to their scientific name, Orcinus orca. In Latin, orca can mean either a large-bellied pot or jar, or a whale. Large-bellied indeed! No matter what they eat, it’s remarkable that killer whales don’t need to eat more than a land mammal of the same size in order to keep their furnace running hot. Their large size and low surface-to-volume ratio help retain body heat. A thick layer of blubber under their skin adds more insulation. Using an adaptation that is shared with the ducks still migrating through our marshes and the chickadees flitting among snowflakes, orcas use countercurrent heat exchange to allow warm blood flowing to their extremities to heat up cold blood flowing back toward their heart. On a chilly walk out in the woods today, my hands and toes went cold, but my core stayed warm. A diving killer whale will likewise send blood from its skin to its core to help retain heat. Another important heat-conserving adaptation these marine mammals count on is that while they have to breathe air, they don’t have to breathe very often. On a cold winter day, we humans breathe an average of 12 to 20 times per minute while resting. Each breath brings cold air in and lets warm air escape. Resting orcas breathe only about 3 to 7 breaths every 5 minutes, and every breath is a conscious choice. As a fellow mammal who enjoys cold water, I feel a bit kinship with these great beasts. They are said to be the most widely distributed mammals in the world (aside from humans), and I do love to find those far-flung connections. As a Midwesterner, though, who grew up in an ocean of prairie, most sea creatures seem like aliens from the deep. Captain Mike was right; this sighting was one for my history books.